The Foundation continues to meet the mission of supporting the college with the following program enhancements and initiatives. Each academic year when a college instructor starts their class preparations and looks at their own department budget, they start a wish list of what they could do if they just had a piece of equipment or the opportunity to use a new innovative technique for a better teaching and learning experience. Each fall, the Foundation allows the instructor to apply for a mini-grant to purchase that special item that can make a difference in their teaching efforts. Since 2008 the foundation has awarded 109 mini grants totaling more than $74,000. In the 2017-2018 academic year, several faculty mini-grants were fully or partially funded from the proceeds of the Foundation Sporting Clay Shoot event and individual donors who wish to support faculty needs. On November 1, 2017 Patrick Busch, Project Director for Central Kansas Upward Bound, presented a proposal to the Barton Community College Foundation Board of Directors requesting funds to establish a food pantry. The pantry provides food to lower the instances of food insecurity experienced for various reasons by member of the campus community, in particular the students. The board agreed to donate the start-up funds required to get this initiative in place before the start of the Thanksgiving and Christmas break periods. Patrick also applied for and received additional funds from the Walmart Foundation and the Golden Belt Community Foundation. 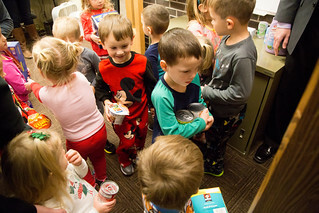 The goal of the pantry, located in an area of library, is to provide access to both non-perishable and perishable foods and increase the number of healthier food options available for students. Many of the out-of-state students who study at Barton do not have access to transportation, and on days when the cafeteria is closed, have no food source except vending machines. Besides normal closings over all extended holidays the cafeteria closes at 6 pm and doesn’t reopen until 9 am or 11 am on weekends. The food pantry has partnered with both the Kansas Food Bank in Wichita (which allows them to purchase food at a greatly reduced price) and also with the Great Bend Food Bank (which allows them to accept food items at no cost). It will be open to all Barton students, faculty, and staff and no qualifying or income information will be required to have the benefit of its use. If anyone wishes to donate to the food bank, cash, perishable and non-perishable foods, freezers, refrigerators, shelving and locally grown or produced food items are appreciated and welcome. If you would like more information or wish to donate, contact Patrick Busch at (620) 786-1182 or e-mail buschp@bartonccc.edu. The Barton Community College Music Department received an early Christmas present from a loyal and beloved benefactor. The Dorothy M. Morrison Foundation awarded a grant to the Barton Foundation for the purpose of refurbishing the Steinway grand piano in the Morrison Chapel as well as the purchase of nine additional pianos to be used by music instructors and in music labs; one 7-foot Acoustic Grand for the stage of the Fine Arts Auditorium; and one Yamaha Hybrid Grand for performances held in the Shafer Gallery. View pictures on Flickr of the Steinway project. Karole Erikson, Barton piano instructor, is just one of those messengers and she states “The Barton Music Department is thrilled beyond their highest dreams thanks to the Barton Piano Project funded by the Dorothy M. Morrison Foundation through the Barton Foundation. The renovations to the 9-foot Steinway Grand Piano will bring it back to sounding and looking like a brand new Steinway by Fall 2018. All of the other new pianos in the Barton Fine Arts Building affect a wide range of people in a variety of ways. 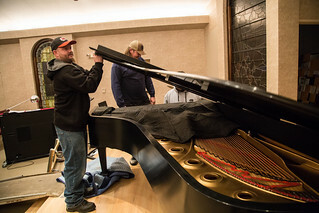 From the piano classes the music majors and minors need for their degrees to the piano classes for Barton students just wanting to learn more about music, these new pianos will assist student learning through new recording advancements and midi capabilities. Ultimately, both audiences and performers at future Barton music events, will notice the positive effects of the new pianos with their fresh, full and expressive timbres. The Foundation is grateful and blessed for the many extraordinary gifts they receive, but it is hard to imagine any gift that could possibly have such far reaching outcomes as this one. The piano project will benefit not only the faculty and staff at Barton but members of the communities we serve who attend any vocal or instrumental event at Barton.